Although mathematics isn't typically associated with these ideas, they have combined to yield a tremendous impact on its development in the U.S. Political conflicts have led to new study abroad initiatives, the creation or downfall of world-class universities, the migration of mathematicians and the stimulus for educational reforms. In February, my University of Richmond students and I launched americanmathematics.org, a new website on the history of American mathematics. It showcases the people who create, the institutions that support and the cultures that influence mathematics. This rich history shows that mathematics is much more than equations or multiplication facts. It's a living, breathing discipline shaped, in part, by the political forces around it. 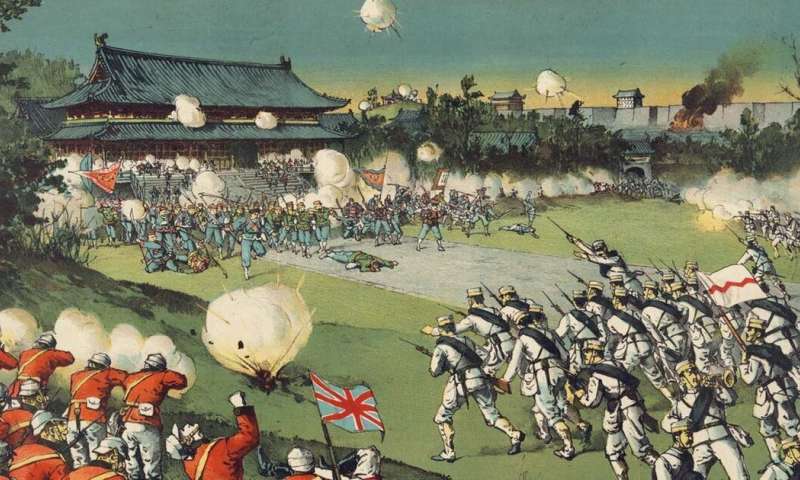 In the late 19th century, a growing anti-foreign sentiment in China led to the Boxer uprising, acquiring its name from the rebels, known as "Boxers," who practiced physical movements that they believed made them immune to bullets. A coalition army of soldiers from eight western countries suppressed the rebellion in August 1900. In 1901, China was forced to pay war reparations valued at about US$333 million to the eight foreign governments over the course of 39 years. The U.S. received about $24 million to $25 million. Many American government officials found this amount excessive, particularly since it exceeded the actual expenses for losses incurred. Edmund James, then president of the University of Illinois, helped persuade President Theodore Roosevelt to return some of these funds and create educational opportunities for Chinese students to study in the U.S. These Boxer Indemnity Scholarships brought more than 900 Chinese students to America from 1911 to 1929. Wang Renfu was the first Boxer Scholar to study mathematics in America. After earning his degree from Harvard in 1913, he returned to China and joined the Department of Mathematics at Beijing University. He later served on the Board of the Chinese Mathematical Society. To prepare students for study in the U.S., the Chinese government also used the Boxer Indemnity Funds to create a college preparatory school in 1911. This preparatory school, known as Tsinghua School, ultimately grew into Tsinghua University. The four faculty members of the initial Department of Mathematics at Tsinghua University included three Boxer Scholars, including Ko-Chuen Yang, whose number theory dissertation improved existing bounds for certain cases of what is known as Waring's Problem. Waring's Problem considers the possibility of writing every number as a sum of squares, cubes and higher powers. The school continues to enjoy a strong reputation today. That rebellion created the opportunity for Chinese students to study in the U.S. and return home to establish strong mathematics programs in China. Later, Chinese mathematicians would receive their training in China and make contributions to American mathematics. World War II and the events leading up to it influenced mathematics in an entirely different way. In April 1933, Hitler introduced the Law for the Restoration of the Professional Civil Service, which excluded Jews and others from employment, including involvement in organizations and professorships. Many Jewish scholars or scholars with Jewish families began to seek refuge in the U.S.
Hermann Weyl and his family, for example, had moved from Zürich to Göttingen, Germany, for him to assume the chair of mathematics in 1930. By 1933, however, with his wife and children identified as Jewish, Weyl accepted one of the first faculty positions at the newly founded Institute for Advanced Study in Princeton, New Jersey. Once there, Weyl worked with colleagues to help other mathematicians find a home in America. This influx of talented European mathematicians included Richard Courant, Emil Artin and Emmy Noether. Their arrival catapulted American mathematics to a new level of international acclaim. This advancement of American mathematics came at the expense of German mathematics. In 1934, the Nazi minister of culture asked the great Göttingen Professor of Mathematics David Hilbert whether the mathematics institute at Göttingen had suffered since the removal of the Jews. "Suffered?" Hilbert responded. "It hasn't suffered, Herr Minister. It just doesn't exist anymore." The launch of Sputnik, the Soviet Union's first satellite, in October 1957 led to another shift in American mathematics, this time at the K-12 level. During World War II, the U.S. government realized that many Americans were deficient in arithmetic, geometry and trigonometry. A national shortage of mathematics teachers didn't help matters. Still, very little reform took place immediately after the war. Sputnik changed all of that. The U.S. now considered how to build a strong sense of scientific prowess and national security within the American populace. The School Mathematics Study Group, the National Science Foundation-funded group that included research mathematicians and schoolteachers, aimed to produce textbooks for every grade of K-12 that explained the "why" of mathematics along with the "how." Their approach became infamously known as New Math. The School Mathematics Study Group worked within an American culture that began to rethink its view of mathematics. Suddenly, mathematics was linked with national security. Politicians endorsed this new approach to math. Parents attended classes to learn how to help their children with the New Math. Teachers attended training sessions. In the end, however, the introduction of the program occurred so swiftly that educators could not keep up with the materials, when they simply did not understand. Meanwhile, the approach proved uneven for students. For example, students might understand the commutative law that allows multiplication of integers in any order, but not the multiplication table it relies on for the computation. Nationalism and political agendas were not enough to make the program successful. Taken together, these three historical events show how political conflict can help or harm the advancement of mathematics.